Experts say for good Makeup you will need good base & for good base you will need good foundation. I totally agree with this thought!! From the day I started learning & using Makeup I have tried so many foundations. The problem which I faced the most is either foundations are too heavy or they look unnatural & cakey on my skin. Heavy foundations sometimes looks like a mask & I personally love natural look that's why I always stick with BB Cream, however BB Creams vanish after few hours. In today's post I am Reviewing one the best foundation which looks so natural, doesn't looks heavy & cakey, stays all day long & hydrates your skin at the same time. It is Perfect for dewy look. 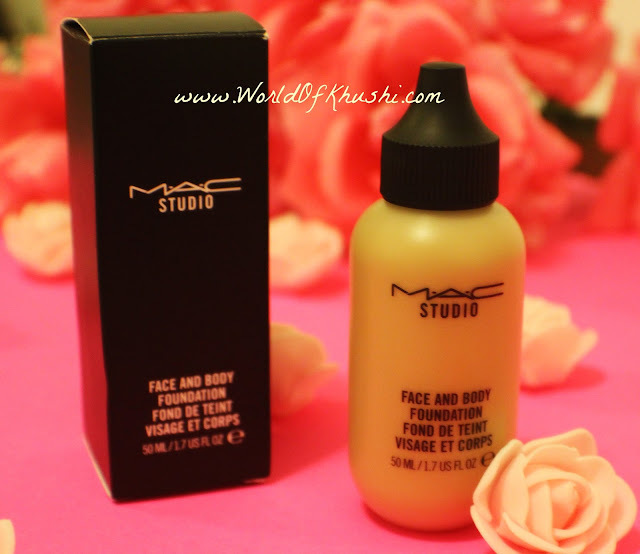 I am talking about MAC Studio Body and Face Foundation. It's very light weight, blends easily, gives sheer coverage. If you have blemishes & dark circle you have to apply concealer before foundation as it's light coverage foundation. You can even mix this foundation to other foundations which are very matte & heavy if you want high coverage. It says that it's low-to-medium build-able coverage but for me it's light coverage. If you are like me who loves BB Cream then you will definitely love this foundation. A comfortable, lightweight fluid foundation with a unique blend of emollients that delivers low-to-medium buildable coverage and a natural satin finish. The moisturizing, long-wearing formula glides onto face and body providing stay-true color. It costs $28 for 50 ml. Also available in 120 ml for $38. 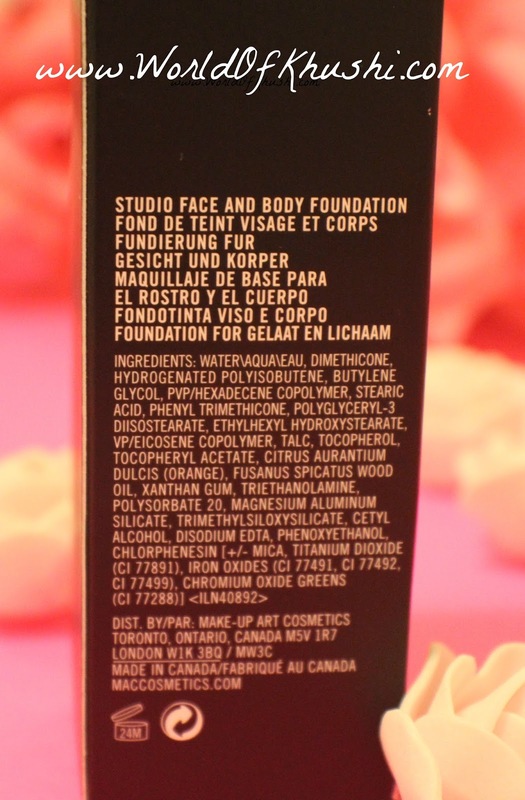 Take some product on the back of hand then apply little dots all over the face using finger tips. Now with the help of damp beauty blender start blending foundation all over the face in dabbing motion. You can even blend with fingers as it's having watery running consistency. I am having the shade C4. 7. Gives dewy glowing skin. 15. Perfect for daily use & beginners. 16. Bottle is made up of plastic so quite light as compare to glass bottle. 17. Can be applied & blend with fingers too. 1. Concealer is a must for dark circles & blemishes as it's a low coverage foundation. 2. I wish they give pump as with Nozzle sometimes you get more product than what we require. One of the best Foundation for normal to dry skin, who don't need full coverage. Best foundation which gives natural looking skin, I wish they could hide my dark circles too. This is my full Review for MAC Face & Body Foundation. Overall I love this foundation. For me this is one of the best Foundation for normal to dry skin, who doesn't need full coverage. For Dark Circles & Blemishes you have to apply Concealer first. Easy to blend & gives you natural finish. If you are beginner & don't like to apply heavy foundation then give it a try. 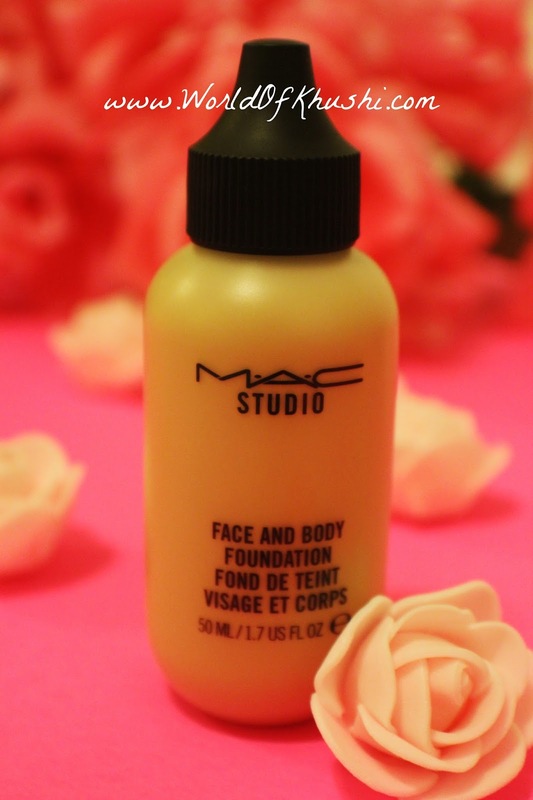 You will definitely love this foundation. I hope you girls get some idea about this product. I wish you all the very best. Let me know your thoughts about this product. For more such Reviews stay tuned with Khushi's World. If you guys want me to do any Review of your choice then do let me know!! Guys do like the post & share it with everyone you know. Follow me on Khushi's World Facebook Page, Google+ , Instagram and Pinterest for more Posts.I will see you in next post till then take care.